Bharathi Cement offers laboratory testing facilities of concrete at your door step where the concrete is tested under standard lab conditions. At Bharathi we believe in total customer satisfaction. Bharathi cement offers laboratory testing facilities of concrete at your door step. Your concrete is tested under standard laboratory conditions and test certificates are issued. 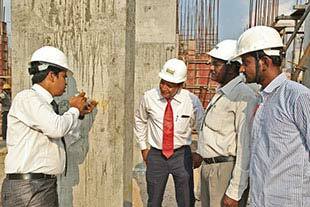 The services of experienced civil engineers can be availed. Today, we bring the same expertise and commitment to quality, as we offer you the following suggestions to make a beautiful home.